Engage NY uses a personal white board system for students to have a reusable tool easily accessible at school and at home to model their work. 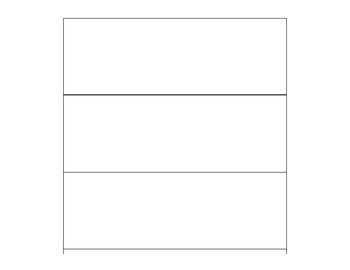 I have found that the templates they suggest are great to have available all year long. Searching through the modules and keeping track of which ones the students need can become a hassle. 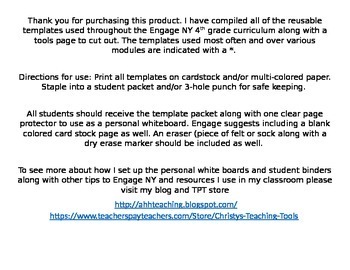 I have compiled all of the reusable templates used throughout the Engage NY 4th grade curriculum along with a tools page to cut out. The templates used most often and over various modules are indicated with a *. 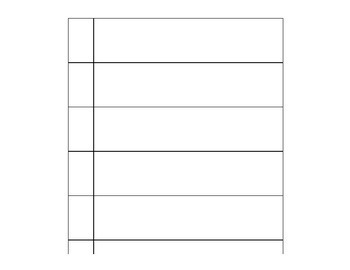 This way students can receive an organized packet printed on card-stock to keep nice and on hand throughout the year. To see more about how I set up the personal white boards and student binders along with other tips to Engage NY and resources I use in my classroom please visit my blog and TPT store.